Recon Campers has quietly been perfecting the small U.S. camper van for the past three years. So far, it has delivered 50+ units directly to customers. Recon is now ready to ramp things up and get further off the beaten path. I recently got the chance to experience the Recon Campers Envy firsthand. 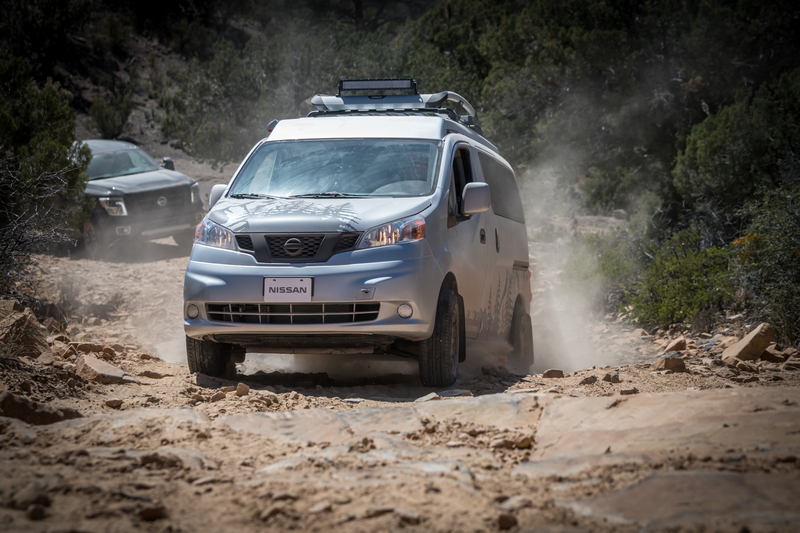 Nissan did a small press event in Sedona just before Overland Expo West. At the event, the brand launched the new Mountain Patrol Armada overland build. While the Armada got a lot of attention, the Recon Camper, based on the Nissan NV200, stole the show. 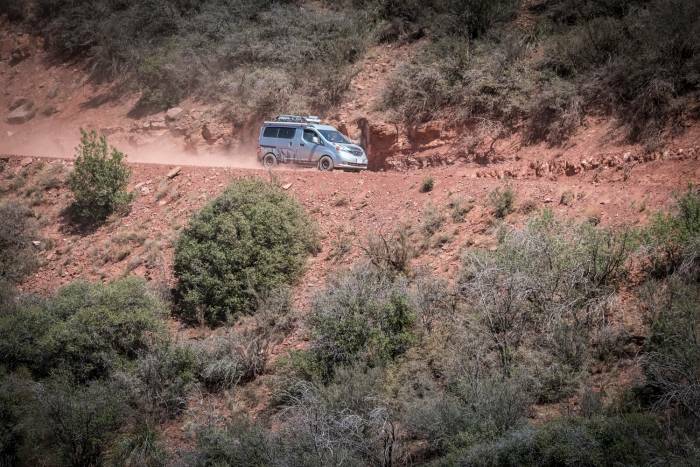 This miniature front-wheel-drive commercial-grade van traveled a pretty impressive on- and off-road route all across the Arizona wilderness during the press event. It’s pretty amazing what a little clearance (6.1 inches stock, 7.75 inches as pictured) and good tires can do! 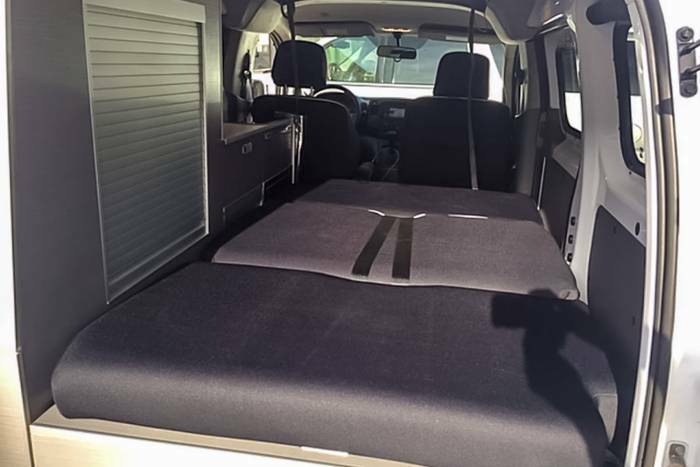 You can purchase a wide variety of camper upgrades for the Nissan NV200 platform from Recon Campers. You can add a pop-top, a folding rear seat, or a full interior buildout, or go all in with the Envy package. 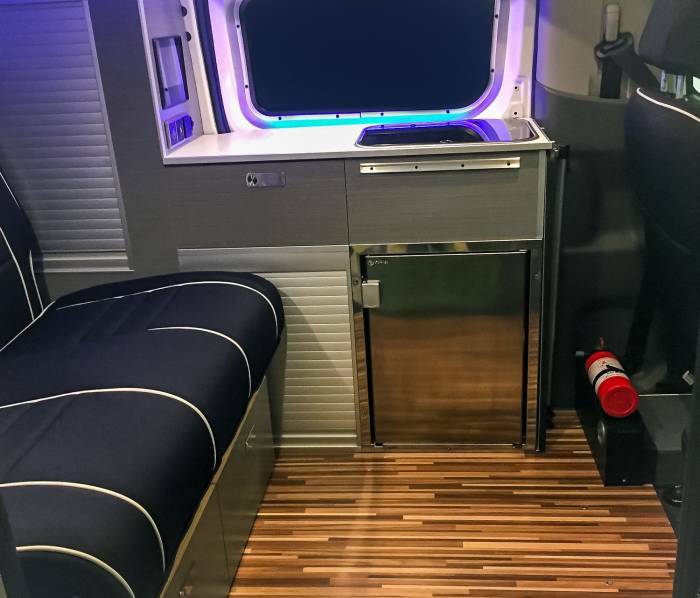 The Envy package is basically a modern interpretation of the classic VW Westy, but it’s on an NV200 chassis. The top pops up and has a bed. And the two-person rear bench seat doubles as a small bed. There are lots of storage cabinets, a fridge, a sink, and LED lighting. One thing a Westy has and the Envy lacks is a swiveling front seat. The Envy has most everything you’d expect in a tiny house. The two things it doesn’t have are a toilet and a cooktop. There really isn’t room in this tiny camper van for a toilet, but a portable stove is a better option for the limited counter space. It’s also usually a better idea to cook outside rather than in the van’s tiny interior. 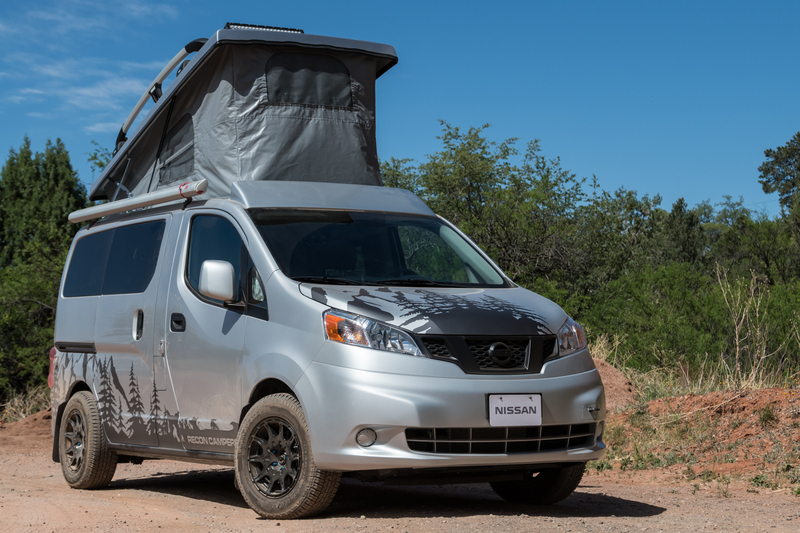 Recon Campers builds its camper systems on the Nissan NV200 chassis. This little commercial-grade van offers up about 25 mpg and 131 hp. A big key to it being a great build platform for camper vans is its large 1,450-pound payload capacity. With a five-year/100,000-mile bumper-to-bumper factory warranty, it’s also an especially good value, with prices starting at about $21,900. Recon Campers founder Stephen Schank’s personal van was at the press event. It was completed just in time for Overland Expo and boasted a few upgrades. The accessories added were a vinyl graphics package, Yokohama Geolanders tires, Method Race Wheels, and some Thule gear-hauling accessories. All in, Schank’s Recon Campers Envy weighs about 3,800 pounds. The Recon Campers Envy is a fully featured and thoroughly thought-out system. The materials and craftsmanship are of much higher quality than what you might find in the typical RV. Everything has been tested thoroughly on the computer, in the lab, and in the real world. Features like the Z-fold upper bed maximize space while being extremely easy and convenient to use. The tambour doors on most of the storage spaces are lightweight, provide a clean look, secure gear storage, and maximize capacity. Teflon 3M tape is used to keep them extremely quiet, even when bouncing down rough dirt roads. All the camper systems are controlled through a truly impressive custom programmed 7-inch touchscreen control hub. The system displays interior and exterior temperatures, water tank level, and house battery health. 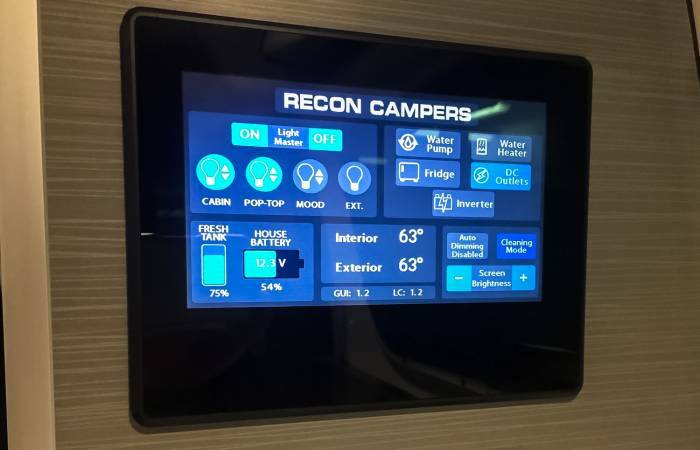 It also controls four dimmable multicolored light zones, the custom 42-liter 12-volt fridge, water pump, and a hot water heater and inverter (if so equipped). So far, Recon Campers has sold directly to the consumer from their southern California manufacturing facility. 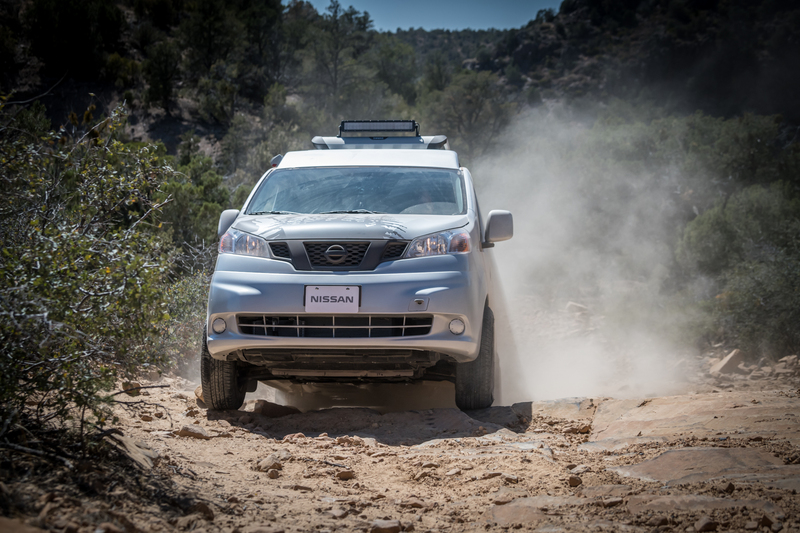 But soon, either late 2018 or early 2019, you’ll be able to buy a fully equipped Recon Campers Envy at a Nissan dealership near you. The Recon Campers Envy buildout starts at $28,500. Features like graphics, seat covers, rack accessories, and solar panels are extra. With the cost of a Nissan NV200 and the buildout, you’re looking at a fully featured pop-top camper van for around $54,000. Sure, we would all like to see this little camper van be offered with four-wheel drive or at least an all-wheel-drive system. In the end, though, does it really matter? 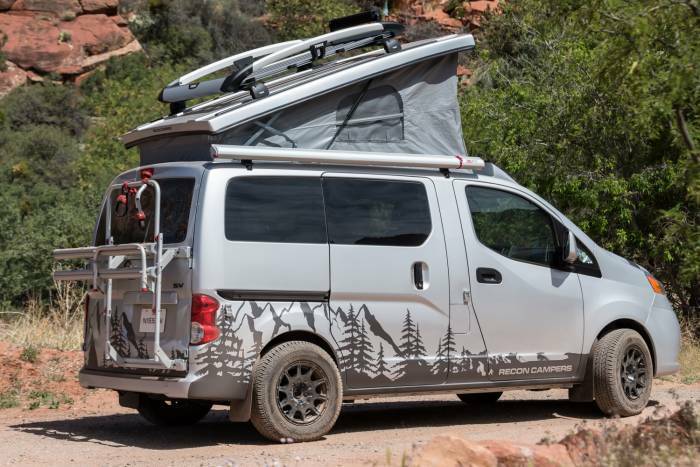 This little Nissan NV200-based camper is built solid and is impressively capable for a two-wheel-drive van. And the Recon Campers buildout makes it into a truly comfortable home on wheels. Just mount up a set of Maxtrax recovery boards, carry along a recovery strap and set of soft shackles, and this little van will go anywhere its 7.75-inch ground clearance will allow.